La Marina: When Dad wanted to dine out with his children, he took us to the newly opened riverside spot La Marina in Inwood (that's way up at the tip of Manhattan where I grew up). It's really nice and has great views of the Hudson River, the Palisades across the way, and the Washington Bridge. The service, the tiny portions, (and honestly the inkjet-printed menus) could have been better, but it was still good dining. Lantern Thai: As much as I've always loved my old Thai restaurant Pongsri, the Pad Thai I had at Lantern Thai surpassed the ones I've had before. It was sweet, mixed well, and flavored just right without drowning in sauce. I can't wait to go back to take advantage of their $8 lunch special again. Wafels & Dinges: We'd seen the Wafels & Dinges cart around the city, but never tasted their sweets. From the photos the stuff looks GOOD and friends have attested to the wonderfulness that is a waffel with Nutella and strawberries (*drool*). Well A. stopped by a cart recently and didn't come back with a plate to share, but rather a jar of the brand's spekuloos spread made from Belgian gingerbread cookies. It's great over toast, but now I want to hunt down a cart to eat through the rest of the menu. La Maison du Macaron: This turned out to be a cute cafe with big comfy couches, long wooden tables, and a huge selection of macaron flavors. Two former greeting card classmates and I met up here this week to talk about our creative projects, stationery, and goals. It's a bit expensive, which is why I opted for a $1.75 chocolate croissant rather than a $3 macaron, but I'd like to return to this quiet space to do work or catch up with a friend. Vanessa's Dumpling House: I've already mentioned how much I love Vanessa's Dumpling House in Chinatown. Not only are the pork chive fried dumplings good, but at four for a buck, they're so damn cheap. The Meatball Shop: The first time I went to The Meatball Shop in Williamsburg, I couldn't stop thinking about their arugula and apple salad for days. Don't get me wrong, their meatballs are delicious, but oh my God that salad!! So when two friends suggested meeting up for dinner, I quickly threw the Meatball Shop into the hat. Thankfully there's one in Greenwich Village so I didn't have to schlep to Brooklyn for the meal of my dreams. I've ordered the same thing twice (the side salad and pasta with the beef meatballs in classic tomato sauce), but after trying my friend's Parmesan cream sauce, I'm going to need some of that the next time around. The portions seem small, but it'll fill you right up. But because we can't eat out all the time, we made pasta and baked our own meatballs for dinner this week. This recipe turned out so juicy, flavorful, and plentiful that we topped them with provolone cheese for sandwiches the following day. What's been on your plate lately? 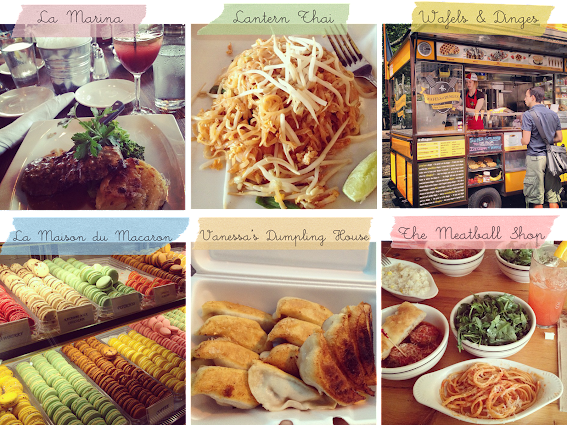 What are your favorite eateries around your city? Seriously, the food is one of the biggest reasons I miss NYC. People too, but definitely the food. You can get everything there. At nearly any hour. And now you've given me six new places to try. I'm still experimenting with restaurants here in DC. I have a couple favorites so far, but it's a really different vibe overall down here and that affects the restaurant styles. Great, let me know if you try them and like them...or if you need someone to accompany you to any of the above! What Have Been Your Favorite Sad Books? "And Though She Be But Little..."